Magerealmhas another surprise for its fans! Developer GTArcade is happy to announce a new winged beauty to join the 3D action MMORPG - Introducing the majestic Avian Queen! Avian Queen comes from the hidden kingdom of Avalon, a place that’s home to a number of Avian races. Long ago, when Avian Queen’s race faced persecution from the harpies, she took her people and created a secret safe haven. Her race built a magnificent city on top of a grove of ancient oaks, high above the ground. Eventually other Avian races flocked to her kingdom seeking asylum, and she welcomed them with open arms. From the tiny Sparrians to the mighty Griffins, many have come to call Avalon home. For centuries, Avalon enjoyed peace and prosperity under the Avian Queen’s guidance and guardianship. However, nothing can escape the veil of darkness. When the forces of evil became a threat to her kingdom, the Avian Queen immediately took action. She sent her Avians to contact the Mage Council and arranged an alliance. Surprisingly, the Queen herself appeared before the Council soon after, eager to join the battle. To save her kingdom, the Queen will bring the fight directly to the enemy. Avian Queen is a master of arcane magic. 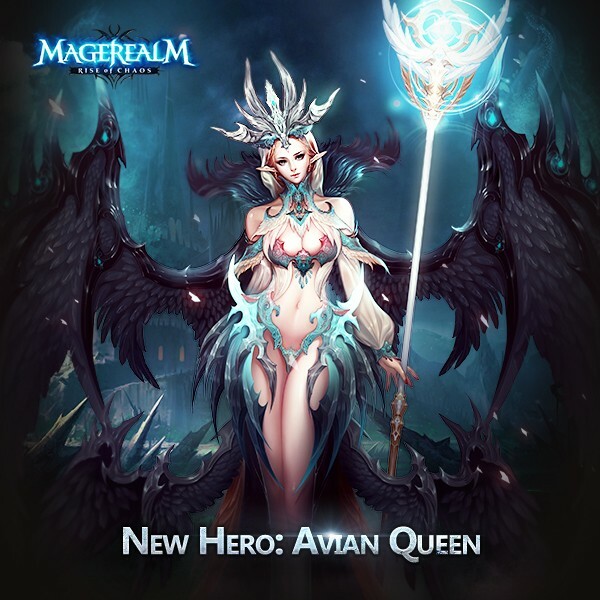 From conjuring violent storms of energy to channeling enchantments to empower allies, Avian Queen is powerful mage that has a variety of abilities in battle. Her Arcane Storm and Astral Burst skills deals significant area effect damage and is ideal for clearing out multiple enemies. She also has tremendous support value with her Focus Energy and Storm Armor skills, able to buff the entire team both offensively and defensively. Her Storm Armor is especially effective against enemies that rely heavily on control skills. Play now and discover Avian Queen’s full potential! Follow Magerealm on Facebook and visit the official forums to get the latest news and participate in rewarding events!